Do you have a pair of “happy clothes” in your wardrobe? You know, the ones you slip into on mornings when you are feeling giddy as a puppy? We do, and so do some of our favourite fashion girls. 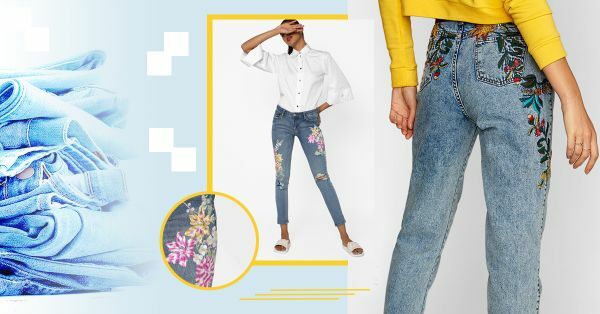 For example, we love embroidered jeans, it was a big hit in the spring of 2017. One of the biggest denim trends of the season, we are excited to take it forward this New Year as well! And why not, embroidered clothing is your best chance at adding artistic details to an ensemble. Such tender details further enhance the appeal of solid casuals like jeans, making them a much sought-after look. From subtle small placements to all over detailing, the embroidered jeans come in an array of designs. Bootcuts to boyfriend jeans, we have put together a selection hot on the market right now! With a soft pink floral embroidery on the front and back of the jeans, the piece has a surprise detail of a little bird on the back pocket. Can this BE any more adorable?! Leave it to Zara to come with a quirky design like this one! With a fresh touch of satin embroidery, these two-tone jeans will make a great style collectable. Black jeans with embroidery make for a perfect contrast. Pair this bootcut number with pastel separates and smart heels. These blush-hued jeans make a perfect canvas for the bright red floral detailing. Perfect for dreamy vacays, match this with light solid t-shirts to bring out the colour in the embroidery. We love when common designs are used in a twisted but smart way on clothing. This acid washed number features a vine embroidery on the back of the jeans. We bet that people on the streets are bound to do a double take with this one! Taking our love for embroidery to another level, this all over pattern is all you need to perk up your everyday casual looks. In the mood to splurge? This yellow and green embroidered jean will become your spring staple this year. Your ticket to street style stardom, these decorated jeans will keep you looking slender and stylish all year long. Switching things up a bit with a quirky snake pattern on the front, this blue washed jean will satisfy your need for ‘out-of-the-box’ fashion. Pro tip: Maintain the embroidery on your jeans by hand or dry washing the jeans, avoid machine wash or tumble dryers. Happy Shopping!